The buzz at Fishburne Military School Thursday had to do with a particular gentleman wearing a sweater of a distinctive shade of blue on hand to watch the opener of the FMS Best Western Waynesboro Caisson Shootout. 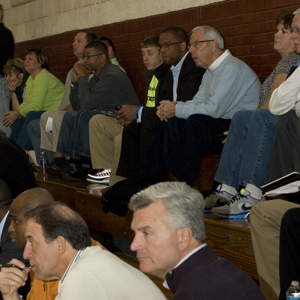 North Carolina coach Roy Williams was in the stands for the opener of the Shootout pitting Miller School and St. John’s Northwest Military School, ostensibly to see Isaac Copeland, a 6’9″ forward at Miller School who is getting serious attention from UNC, Virginia, North Carolina State, Missouri and Ohio State. Ol’ Roy was out of the building by the time game two of the day rolled around. FMS, ranked #6 in the national polls, easily dispatched Southern Virginia University by a 103-41 final behind a team-high 15 points from Memphis signee Kuran Iverson. It was a laugher for everyone but Fishburne coach Ed Huckaby, still stinging from the 85-76 overtime loss to #2 St. Thomas More that his team suffered in the National Prep Showcase two weeks ago. “I was not pleased with our last effort against St. Thomas More. Don’t get me wrong. St. Thomas More is good. But there’s no way that game should have carried to overtime. Our effort stunk,” said Huckaby, who preached effort in his postgame talk with reporters. The weekend will be all about effort from Huckaby’s perspective. Fishburne plays Gray Military Academy Friday and then finishes up the Shootout on Saturday against third-ranked Kiski School. “I’m going to keep changing the lineup until we get some guys out there playing with effort. We can be really, really good. Tonight was just glimmers of it. We can be really good, but not if we don’t put out effort,” Huckaby said.